Venue: At V&A Museum(London) and the world. Nearly 70% of the human body is composed of water. Long ago we evolved from the sea to the land, which makes up less than 30% of the earth’s surface area. Now it is the Internet that connects the continents as we exchange information through submarine cables. From the start of this century, the benefits of the Internet are spreading across the land. However, the more we think about and look at nature, the more we realise how the global system of oceans connects everything together. Water is ever-changing in form, evaporating, drifting in the air and moving around the earth. 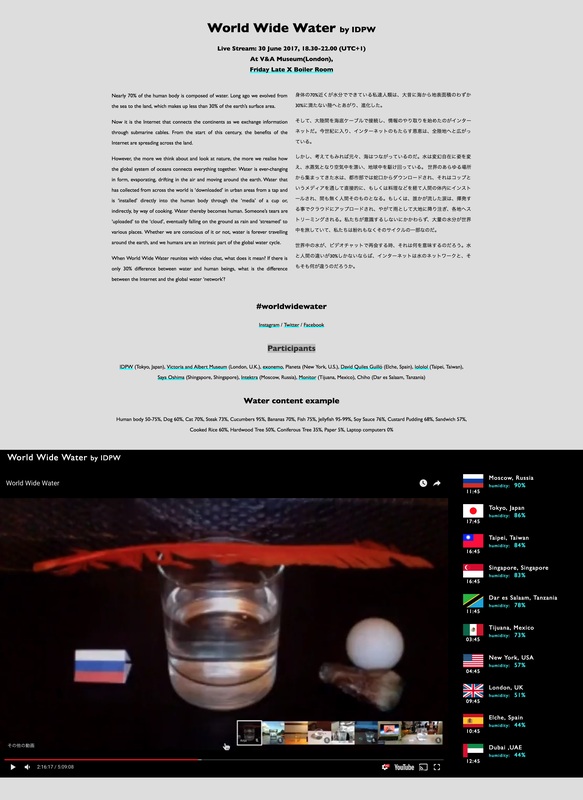 Water that has collected from across the world is ‘downloaded’ in urban areas from a tap and is ‘installed’ directly into the human body through the ‘media’ of a cup or, indirectly, by way of cooking. Water thereby becomes human. Someone’s tears are ‘uploaded’ to the ‘cloud’, eventually falling on the ground as rain and ‘streamed’ to various places. Whether we are conscious of it or not, water is forever travelling around the earth, and we humans are an intrinsic part of the global water cycle. When World Wide Water reunites with video chat, what does it mean? If there is only 30% difference between water and human beings, what is the difference between the Internet and the global water ‘network’?